More and more consumers want to know what’s in our food and where it comes from. The melamine-tainted chow that’s killed pets came from China, and now the FDA is testing Chinese wheat, corn and rice additives that go into processed food for people. Some breads, pasta, cereals, pizza dough, protein shakes, energy bars and baby formulas are being examined for melamine. 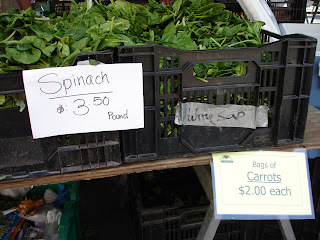 Tender new spring spinach is everywhere now. For a quick vegetarian supper, sautee onions and garlic in whatever oil you prefer or that’s produced closest to you, add sliced mushrooms and a pat of butter for flavor, and, at the last minute, stir in a bunch of well-washed spinach. Serve over pasta or rice, or in a tortilla. In grocery stores, look for signs and labels that identify vegetables, fruits, meats and dairy products by state, country and region. At the Union Square farmers’ market in Manhattan, I bought apple/cranberry juice from Red Jacket Orchards, whose fruit is farmed with integrated pest management (IPM), using beneficial insects and turning to synthetic pesticides only as a last resort. I asked Max when their first fruit crop of spring comes in. “Strawberries. In May,” he said with a smile.